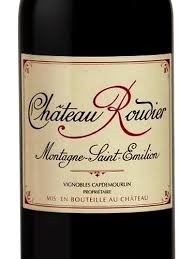 Chateau Rodier is owned by Vignobles Capdemourlin, a large and highly regarded Saint-Émilion wine company. These grapes are from Montagne-Saint-Émilion, the largest satellite of the more famous Saint-Émilion appellation in the right bank Libournais sub-region of Bordeaux. 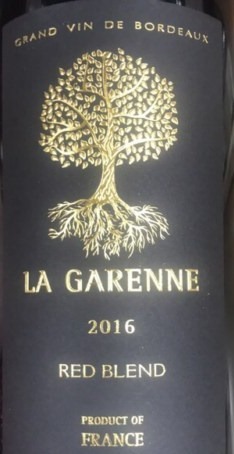 This is straightforward vin ordinaire, a rustic table wine made from mostly Merlot, a lesser percentage of Cabernet Franc with a small amount of Cabernet Sauvignon. The nose is quite ripe showing black plum and a hint of raisin, with prominent graphite. The palate sports a juicy introduction with leather and licorice, but hard, bullying acidity enters at midpalate battling with grainy, grippy tannins to create quite a scrum on the finish. Oh well. There is lots of robust flavor here, sinewy with utterly no finesse but an honest wine. When you can find no information about a wine online that tells you it is probably a private label wine, made specifically for a retail operation and sold there exclusively. These are usually bulk wines made by large companies and branded by a marketing team. The producers like the guaranteed sales channel with no marketing costs. The retailers like them because they have higher margins and no price competition. They can be decent or dreadful but there is no way to know except to try them. This wine (not to be confused with Domaine de La Gareene) is probably a private label wine made for Trader Joe’s. The grapes are sourced from the large appellation, Blaye—Cote de Bordeaux, a bulk wine region across the Gironde River from Medoc. The blend is likely Merlot, Cabernet Sauvignon, and Cabernet Franc. For $8 this is good value. It tastes a bit like Bordeaux except softer with less acidity than is typical. Red current, coffee, and graphite with a licorice hint are the dominant aromas. The juice is soft and lean but sports a mineral layer that gives the wine some firmness and heft. The finish features soft tannins and medium acidity with a note of bitter burnt wood that is distracting. A very dry wine with no hint of sweetness, it feels compressed and lacks expression, with very little movement on the palate. But it’s not trying to be something it’s not. An ordinary, rustic table wine from Bordeaux at a good price. What’s not to like? This is a $30 wine from a Chateau with a solid if unspectacular reputation, from an uncelebrated region compared to its more famous neighbors in St. Emilion, and from an inferior vintage. So why is this wine so damn good 22 years after vintage date? This is quite revealing about Bordeaux wines at least as they were made many years ago. Even the cheaper bottlings were built to age and some of those rugged wines that seem to be little but dirt and acid when young become elegant charmers when mature—like some people I’ve known. This wine shows still vibrant cherry, loads of leather, and pleasant, damp-forest-wood aromas, with a bouquet of dried roses. There is not a bit of mustiness on the nose. The palate is backward. Graphite with some hard acidity up front is replaced by flirtatious, fresh berry that blossoms at midpalate. The fruit dries out on the still robust finish but mouthwatering acidity, and drying yet softly textured tannins provide good length and sustained satisfaction. I suspect this was a hard wine when young. You can still taste vestiges of that stubbornness but the wine now moves with vibrant ease through its stages showing modest beauty, exuding an amiable warmth, comfortable in its skin but possessing depths. Etta James’ A Sunday Kind of Love has the warmth, simple charm, and mature fortitude of this wine. Technical Notes: 90% Merlot, 10% Cabernet Sauvignon, aged 15-18 months in new and used French oak. Fronsac is located close to the northern bank of the Dordogne river, just a few miles to the west of Libourne , with soils consisting of more sandstone and limestone than clay. I found this lurking in a liquor store in Salt Lake City for $13. Such finds are to be treasured, not because this is a great wine (it’s not) but because it’s an honest wine sourced from average grapes (the vineyard is near Fronsac), albeit from an excellent vintage, and not manipulated to taste sweet, soft, or smooth. In France, even ordinary wines are sometimes made with the assumption that the buyer may lay the wine down for a few years. The wine is allowed to develop on its own schedule without the new world’s obsession with making wines that are ready to drink as soon as they’re bottled. It’s always interesting to see how inexpensive wines designed to age turn out. I imagine this was a beast when young but after several years of bottle age, it’s developing a soul, albeit a soul with an irascible core. An aromatic dark knight with scents of black cherry, black plum, dry autumn leaves, and a hint of barnyard, immediately identifiable as French. In the mouth, an overlay of gravel and dark chocolate buries the lush, ribald fruit and a seam of hard acidity gives the wine a truculent, unyielding personality. 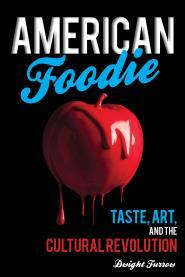 But it has personality–like your curmudgeonly uncle whose candor you find refreshing. There’s a lot of savory flavor, black olive and bitter herbs, and eight years after vintage date the tannins have a sandy texture with little grip, propelling a long, mouthwatering finish. A bittersweet wine, like a rough hand, tender and calloused. Night Driver by Tom Petty shows the best side of this wine. Technical Notes: A blend of 70% Merlot, 20% Cabernet Sauvignon, 5% Cabernet Franc and 5% Malbec. Cold soaked, and then fermented in unlined cement vats, macerated for 25 days, and aged on the lees four months before aging in new and used demi-muids. 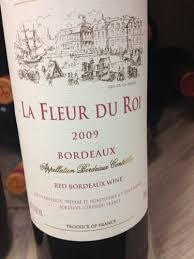 An inexpensive Bordeaux that is rich and full of flavor yet distinctly Bordeaux? Impossible, you say. It’s rare as a nun in a bikini, but this one get’s close. Deep plum, with pungent scents of freshly turned earth and a hint of barnyard playing in the background, on the palate the fruit is laced with coffee, soft and round in the mouth and surprisingly dense for Bordeaux. The acidity is low but the midpalate shows some steel, the tannins have grain but no grip, showing off a medium length finish with a nice seam of pure fruit. From an exceptionally good vintage. Blaye is a large wine region producing mostly cheap Merlot on the right bank of the Dordogne northeast of the more celebrated regions of Pomerol and St. Emilion. There are gems to be found there. The mood evokes a soft, mellow rusticity. Bonnie’s got some barnyard in that voice. Cheap Bordeaux but from a specific sub-region rather than the generic appellation? That’s unusual but Trader Joe’s sometimes tracks down the unusual. Alas, if it’s cheap Bordeaux it’s basically dirt and acid. But there are several layers of dirt on the nose with good intensity—some dust, damp leaves, newly turned soil, good clean dirt. The palate shows a seam of ripe, concentrated red and black fruit on a medium body frame with hints of cocoa. Incisive acidity threatens to turn sour and the tannins are young and grainy with some chew but the mouthfeel is supple. It’s rough around the edges but delivers lots of flavor for the price. More ripeness than is typical of Bordeaux in this price range, otherwise it’s classic vin ordinaire. This co-op wine from Alliance Bourg is interesting and unusual. Aromas of dried black cherry, dust, and hints of fennel contend with more raw wood than is common for Cotes de Bordeaux but I found it intriguing. My guess is it’s designed for the International market. Up front it’s a bit meager in the mouth with dried fruit on a light to medium body. Angular, but with plenty of back end structure, the texture fills out as it lingers on the palate with good length on firm tannins. The menthol character on the finish is quite refreshing. It could use some more time in the bottle to allow the oak to integrate. This is made by the co-op Alliance Bourg and features a blend of 80% Merlot and 20% Cabernet Sauvignon. Blaye is a large, diverse region on the Right Bank across the river from Medoc. 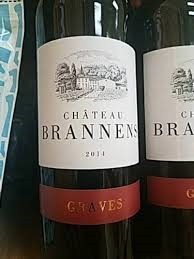 Now part of the Cotes de Bordeaux appellation with the designation Blaye subject to more strict standards they produce a lot of ordinary table wine but there are some good bargains to be had. I picked this up for $12 at Costco but I’ve seen it listed at $37 upon release. It is definitely worth $12, at $37 I’m less enthusiastic although its eccentric, yet rustic charm will still satisfy. It will likely age well and may be worth laying down. Rustic but a bit garish and bohemian in the way it flaunts its originality, a good wine for the hungry women on Rue Morgue Ave. The endless search for inexpensive, drinkable Bordeaux continues. This one is drinkable and interesting although not quite classic Bordeaux and not quite inexpensive. This wine is the brainchild of American sommelier Richard Betts in collaboration with French negociant François Thienpont. St. Glinglin is translated as “when pigs fly” as in when will Bordeaux make a good, cheap wine, according to Betts. A little funk is always Bordeaux-like and this wine has it Mushroom and a dank mossy note hangs on the dark, plummy, stewed fruit. The fruit is darker with more depth then most inexpensive Bordeaux. In the mouth this is no California charmer. Big but not plush, the rich, ripe fruit and coffee is set off with plenty of tangy acidity on a medium plus frame that finishes long but with woody bitterness from prominent tannins on the back end. There is good density on the midpalate and its all rather briary. 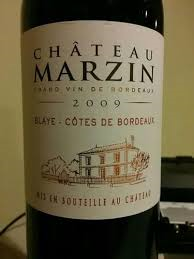 Intense and without the dreaded leanness of many inexpensive Bordeaux, it has lots of juicy flavor but a distinct rusticity nipping at the edges, situated between the new and old world which I think is the point. It’s 100% Merlot from the right bank regions near St. Emilion banded together under the Cote de Bordeaux appellation and aged for 18 months in concrete vats so the woodiness I get on the finish is a little puzzling—maybe some oak chips? This is bold, dense, a little tough, but tender—a Katniss wine. This song from 60 Channels” Still Burnin’” brings out some intricacies on the nose and tamps down the bitter wood on the palate. Barton and Gustier is a very large negocient firm and wine merchant that has been around since 1725. They buy grapes or raw wine from various regions in France, vinify, blend, age and bottle them and ship the final product to their worldwide markets. This is their entry level Bordeaux and is really quite ordinary. The nose shows muddy, dark fruit, a bit stewed, chocolate and loam give it some depth but the readily apparent green pepper is unpleasant. The palate, despite more murky fruit and earth, is bland, with a hollow midpalate before the tannins kick in. Neither rich, not sweet, nor taut it’s a middle-of-the-road wine, drinkable but unremarkable. It finishes short with sandy tannins and some sourness. It doesn’t scream Bordeaux but it’s lacks the concentration of new world wines. What’s dark, murky, a little bland? The Black Key’s Fever. This is what cheap Bordeaux should taste like. Simple plum with chocolate hints that peek around the funky earth that reminds me of decaying leaves (which to me is a pleasant aroma). This is an everyday wine but it has the vigor to move the mind placing you in a forest in early fall. An under $10 wine that can do that is to be treasured. The palate is round up front but tart acidity is immediately apparent so the texture feels layered despite being a bit slender. The tannins are soft at first and then gently drying with acidity driving the medium length finish. 80% Merlot and the rest Cabernet Sauvignon. A humble but sincere wine with an autumnal flair. The hushed but hopeful Northern Sky by Nick Drake with its softly vibrant texture captures the mood.